October 24th, a day to unite and respond to a call to action. In 5 days, we will see 2009's International Day of Climate Action. Log on to 350.org to find out more about global warming, the politics surrounding this touchy issue and what you can do to help. Anything you do will make a statement-- from uploading pictures incorporating the number 350 to donating money to registering for the cause. Together, we can catch the attention of the media as well as our nations' leaders. For the future of our planet! <-350! 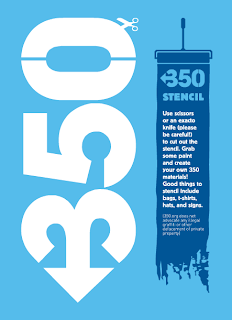 Artists, athletes and writers alike can participate in the 350 movement!